"I had never heard of these until I met my husband, Mark, who is English. They are simple and delicious! They freeze really well too." Unfold the puff pastry sheets, and cut along the fold lines of each sheet to form 6 equal squares for a total of 12 squares. Brush each square with mustard. Divide sausage into 12 pieces, and roll into small logs. Place one log on each square. Roll dough around the sausage, and seal with a bit of beaten egg. Place rolls onto an ungreased baking sheet, and brush the tops with the rest of the egg. Bake for 20 minutes in the preheated oven, or until the rolls are puffed and golden. I usually watch after 10 minutes or so to make sure they don't burn. These freeze (unbaked) very well. 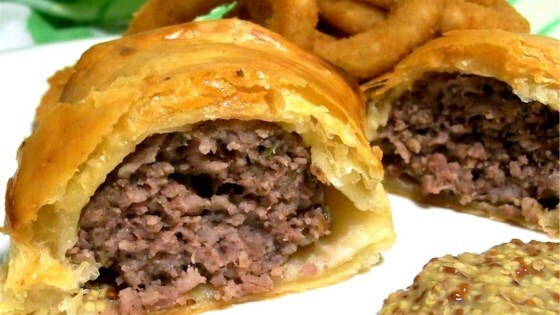 It was too greasy and I don't care for the taste of the sausage, dijon and the puff pastry, not a good combination.